Win ECA - 1 MILLION coins! As we have promised, there is a new contest for you that we organized with Electra’s team - the funders of the prize! ElectraCoin is a cryptocurrency newly added to CoinDeal - a cryptocurrency exchange platform, as a result of the 8th voting in our "vote for a new cryptocurrency system. ECA is created on Electra blockchain using NIST5 hashing algorithm. This cryptocurrency is a decentralized POW/POS digital asset providing fast and secure transactions. The contest starts on October 19th, at 13:00 (UTC+01:00) and will last for the next 3 weeks until November 9th. 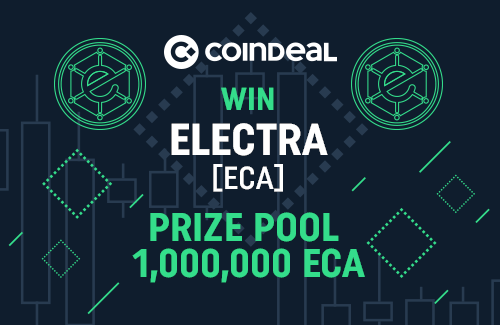 The prize pool is 1,000,000 Electra! What to do to become a winner? winners will be chosen by the trading volume on ECA/BTC. follow ElectraCoin on Twitter and join the group on Telegram. Take over the ECA market and win thousands!